Early this morning, a throng of people showed up at Union Temple Baptist Church in Ward 8 to collect on their Marion Barry-sponsored turkey. And walked away empty-handed. According to a press release from Barry’s office, the 2,000 promised turkeys were delayed in arriving this morning due to “Giant Grocery Store’s corporate inflexibility.” It seems that the corporate execs at Giant were not amiable to the idea of sending such a large amount of food without full payment from Barry’s office. The $26,000 was required in full by the grocery store chain before they would deliver the turkeys; Hizzoner’s office had only raised $17,000 of the required amount. “First of all, I must apologize to the Ward 8 community for Giant’s failure to provide timely support to the Community. It’s simply pathetic and incomprehensible to me that a multi-billion dollar corporation, like Giant, would take a position that would deprive children, seniors and other adults of food for the Thanksgiving holiday”, Barry said in the press release. 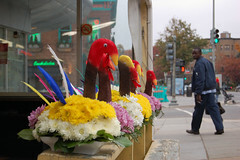 Not to nitpick, but it’s not Thanksgiving Day just yet, so I personally fail to see how a delay of one day is depriving the people of Ward 8 of their free bird. And to that end, Barry, I’m pretty sure your track record of giving taxpayer money to the wrong people prompted Giant to require payment in full; if they hadn’t, just how much of that $26,000 would you have pocketed or given to ex-girlfriends or cronies? Your assurances aren’t exactly the gold standard around here. I’m fairly sure Giant wouldn’t let anyone just walk in, demand food, and then promise payment later because the money coming to them was simply delayed by bureaucracy, and how dare they be inflexible to meet my situation? That’s just heartless. Apparently, Giant refused to give in, so now a check for $26,000 (wonder where the missing $9K came from?) is on its way to the company. Giant is thawing out the promised turkeys today and will be delivering them tomorrow at the Union Temple church starting at 9 a.m. No Thanksgivings for Ward 8 recipients will be ruined, no children or seniors denied. And no word on if the company has donated a giant bag of stuffing for Barry’s personal use, either. This entry was posted in: All Politics is Local, Business and Money, The Daily Feed, WTF?! hmmm..$13 turkeys? they must be huge 26 pound birds cause im pretty sure turkeys are on sale at Giant this week for $.47/pound.